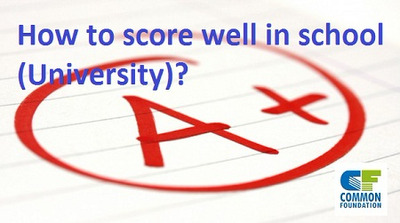 Santosh Pyakurel - How to score well in school (University)? A lot of youths now are concerning more and more about their university life. Normally, they always want to perform well in class, but oftenfail to do so. In this point, what is the problem? Is that because students are not smart enough or because of any other factors? Of course, everyone who study at university might face with many challenges, but they have to try in order to suceed in gaining transcript with excellent grade at the end of the year. Oh, why is transcript important? Yes, it really important when you want to apply for an international scholarship or any exchange program. Not only this, it is also an evidence which prove that you are potential for jobs or opportunities in the future. 1. Doing well in school is not what you get free. Some people just born with this ability, but most people need to try in order to success such this kind of things. In this article, you will find some tips which can help you, mostly university students, achieve good grade. First of all, you should try to understand basic task. This mean that you have to understand about your major or subject you study every day before class start. Sometime there is course you do not know about, so that will be a disaster if you just come to class without any research. Thus, you are supposed to search, study and understand more about the subject. Put more attention to where you need to improve the most. Once you got that, the next step is to look into each subject’s documents or textbooks. First thing to do about document is to scan through content, find the connection of document and subject and so on. Besides this, you should also find time for a little review too. Find time for yourself, whether what time or what environment you fit the most, and study at the time. 2. The time you spend in class. Each and every day, before the class starts, you should find time for a little preparation of 10 to 15 minute. This can help you have something in your head, and when the explanation come, you will easily understand. Beside preparation for the next class, you should also review what you had learnt from last time too. During class, the most important thing is to take a very good note. This is not mean that you have to write down every single words teacher says, but to write piece that you think is good part of lesson. In order to take good note and perform well in class, you are supposed to listen carefully and consciously to lecture. Approach teacher immediately if you have something you do not understand. 3. Being a responsible student. Normally, you have to create a good and regular schedule for yourself, when you eat, when you sleep, when you go to class, when you have to do homework, when you have to read, when you have to review, everything is always should be in order. Being a responsible student is not about doing all homework, but you have to attend all classes, doing more reading, doing more research, taking advantage of every single minutes of time. Besides self-study, good student is also seeking for help from other people. Sometime working or study with other people can give you a lot more ideas and new creation. 4. Make a better lifestyle. In order to do stuff above, you must have good health. In this, it means that you are supposed to take plenty of sleep, eat healthy food, and do a regular exercise. This habit would help you a lot in boosting your power up, to perform well in class. Common Foundation Pvt. Ltd is a career based educational consultancy based in Putalisadak( Opposite left of Kumari Bank Ltd.) Nepal acn be contacted at 01-4010675 and 9845536915. Till today, there have been 14891 visitors (25038 hits) on this page!